Introduction to Experimental Enamelling Techniques for Jewellery: Weekend Course. Explore a range of experimental enamelling techniques to give lasting colour and texture to your jewellery. 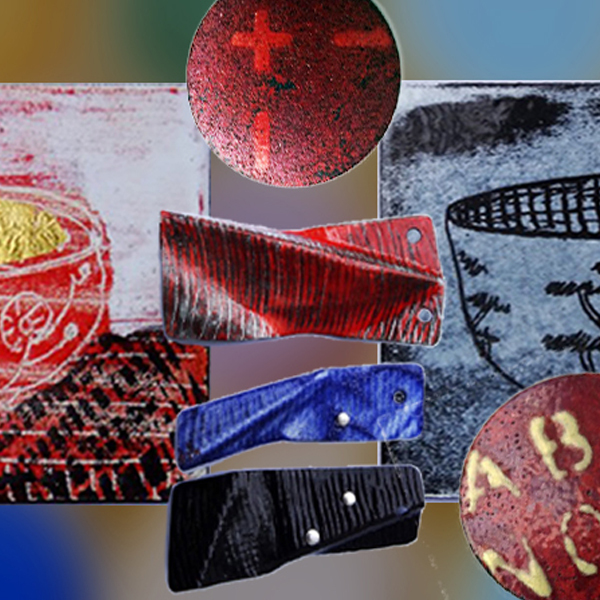 This is a dynamic 2 day course where you will have lots of scope to experiment with enamelling techniques on a range of materials. You will learn to sift powdered enamels onto copper sheet. You can try blending colours, you can use stencils to give definition, and you can draw through it to produce unique patterns and textures. Using pre-enamelled steel sheet you will then have the opportunity to use liquid vitreous enamels to paint or draw with colour. The course draws focus to the process of experimentation and through hands-on experience you will gain sound knowledge of this complex but rewarding material. Enamelling is not difficult to learn, but it is an unpredictable and therefore exciting process. This course will teach the basic technical aspects of the craft, alongside the associated health and safety issues related to the use of enamel powders and liquids. We will first learn how to obtain a well-fused enamel surface, and then through guided experimentation we will explore mark making techniques on copper and steel, and on the second day we will develop a finished piece of jewellery using cold connection techniques. You’ll produce a range of test pieces that reflect your personal interests, style or aesthetic. We anticipate that your samples will provide lasting reference -and inspiration- for your future jewellery projects. On the second day there will also be opportunity to devise suitable cold connections that will enable you to create a wearable item from your favourite test piece. The course fee covers the cost of all materials. Metals available for your use include copper and enamelled steel. A selected palette of powder vitreous enamels will also be provided. You may also bring your own precious materials to work with,; in this instance please note we recommend using fine silver rather than sterling silver for enamelling, due to the inherent processes and behaviours of the materials involved. We are able to offer a hallmarking service for precious jewellery made at Flux – If you would like to have your work hallmarked with the Flux Studios hallmark this can be arranged at cost price.